RuneMetrics is an analytics tool, released in 2016, that eventually replaced the Adventurer’s Log later the same year. It’s an in-game and website based feature. All players can now access an experience tracker, drop log, and basic website functions aside from the old XP tracker. The free features of RuneMetrics are pretty much two. The first one is that it autopopulates the Metrics interface’s xp track and tracks total xp, combat xp and skill xp in all 27 skills. The second one is the drop logger, which can be toggled to show all the items dropped or picked by you. Drops processed by drop cleaners such as the charming imp are counted as well. If you ever wanted to have a precise and easy way to make certain calculations about your gameplay and keep track of them, as well at to count your experience and drop gains, RuneMetrics Pro is the tool for you. When you subscribe to it, you get full access to the tool’s features. You can buy it for $6.99 per month or 1 bond. You can buy cheap OSRS gold in order to purchase bonds and get your RuneMetrics Pro tool! A discount for players who bought the gold premier club was available all through 2018, and they could get access to the full features of the RuneMetrics tool for only £1.79 per 2 months! RuneMetrics Pro is available also for Free-to-play players. When your RuneMetrics Pro subscription runs out, your data keeps being stored for two more weeks. If three months pass by with no renewal of your subscription, your data will no longer be kept. 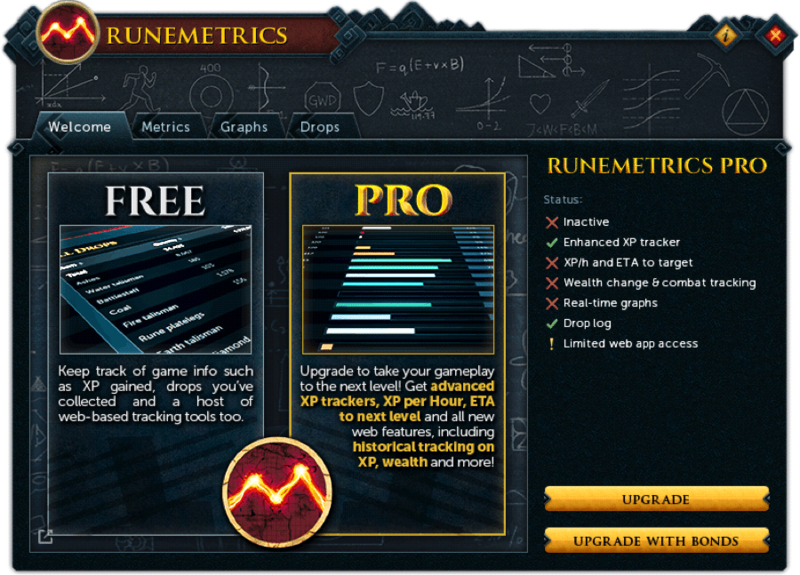 RuneMetrics Pro has the free features of the unpaid version, as well as a bunch of new ones. With RuneMetrics Pro you get a skill xp tracker which shows your xp/hour based on a previous window of 5 min gained xp, as well as a skill xp tracker which shows ETA for time to level. This does a great job for player-set targets, including such about a virtual level, but it’s also applicable for the defaul target to the next level. The combat xp tracker shows total damage, as well as damage per minute, accuracy and xp/hour and it doesn’t reset when you change monsters. Wealth tracking and GP gain and loss per hour is calculated on a 5 min window. The wealth tracking includes that gained or lost from completing clue scrolls and transactions on the Great Exchange, but you can’t view the info from these two separately. When right-clicking the Metricks tracker, you get a “send to graph” option which allows you to see a graph of your xp gains over time. The time period can be adjusted by scrolling in and out. You also get links to access historical data on the website. You can access the interface from the ribbon for player using the Evolution of Combat mode. It has replaced the Grouping System icon. You have a Welcome tab which is basically a link to the RuneMetrics web page and an overview of the status of the paid option, as well as a link to purchase it and to manage your bonds. In the Metrics tab you can reset your customisable interface layout into the default layout. Here you can find some toggles, such as showing a red tint around the player’s screen as a health warning when the player has less than 20% health remaining. There are also selectable settings for some functions, as well as a tracker for the remaining subscription time for those who purchased RuneMetrics Pro. If you’re looking for toggles affecting the Graphs interface, you can check in the Graphs tab. You can find here the show average field toggle, the show min/max values toggle, and many others. To toggle the showing of stack value and to select the drop log mode for the Drops interface, check the Drops tab. This entry was posted in How-To Tips & Tricks, Latest OSRS News, Old School RuneScape, OSRS Mobile App, RuneScape 3. Bookmark the permalink.